Donte Collins ’18 was named the “Most Promising Young Poet” by the Academy of American Poets this fall. His poem, “what the dead know by heart,” previously won Augsburg’s John R. Mitchell Prize, which qualified him for the prestigious award. 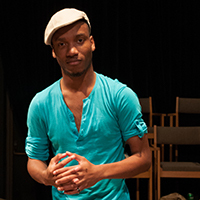 Collins is a theater major who is active in the local, regional, and national spoken word and poetry scene.